One thing I will say, is for the money IMHO the knife is worth every penny. Its been my EDC for two months now and hardly know its there. I own Benchmades, Gerbers, ZTs, and CRTKs. I can carry what I want, but keep this Spyderco with me. Maybe because its so damn cute….. lol I love it. I totally agree Michael! I carried a Tenacious for many months and beat on it mercilessly. It held up really well and is a nice size folder for dirty jobs. The smaller Ambitious and Persistence are 2 other great options if you want something a little more “friendly” for public use. Thanks for stopping by and leaving some thoughts! Have you had the opportunity to handle a Persistence as well? As you stated the Tenacious is not a small knife and I don’t want to freak others out if they happen to see it. What would be the limitations of the Persistence verses the Tenacious? I can see not being able to completely slice through things like a large tomato. Thanks so much for the great question. Oddly enough I have not yet had an opportunity to handle a Persistence yet. I really should just buy the whole lineup. The Tenacious is a pretty large knife for EDC in a public / urban / suburban setting. The Persistence might be a nice compromise as it will have the same build quality and materials as the Tenacious in a smaller footprint. Possible disadvantages would be the shorter cutting edge as you mentioned (which is useful in both utility and self defense scenarios) and the ergonomics may not be as good. Having never handled a Persistence it’s impossible for me to comment on how the ergos are, but being a smaller knife you generally have less real estate. Personally, I find a smaller knife works for most of my EDC needs. I can cut apples and stuff with a smaller knife, which is about the extent of my usual food prep chores. When I am in the kitchen I almost always opt for a dedicated chefs knife. If you need a folding food prep blade for say, camping or a lot of picnics or something I’d consider a larger knife. Wow, you sure are prompt with your replies! I agree about either a dedicated chef knife or a larger folder for camping and already have that covered. I realy like the Spyderco brand, but all the knives I have from them are the lockback style. 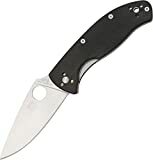 I would like to try some other types of locks from Spyderco, but with the times being as they are, I don’t have a ton of extra cash just laying around. This is why I am thinking of possibly getting the Persistence instead of the Sage for example for an EDC. Thanks for your good reviews! Keep ’em coming when you have time! Based on what you are talking about I think the Persistence might be a good fit for you. The Tenacious is a good knife for the money and I don’t doubt the Persistence provides that kind of experience as well. If you do happen to acquire one please let me know what you think – I am sure others will be curious as well! I have recently handled the three knives in this line, and decided to purchase the Persistence. I am increasingly spending more time in an urban environment where a large knife tends to scare people, but I can be in the wilderness in a matter of minutes. Because of this, I like to carry a substantial blade. The lack of size of the Persistence is made up for with a rugged build, thick lock, and a stout blade. This has made the Persistence the perfect balance for the environment in which I live. While the ergonomics are not quite as good as they are on the Tenacious, I can still get a comfortable four finger grip on the Persistence. The handle length is similar to that of my Buck Vantage Force from the bottom of the flipper back. Just for reference, I wear a large glove. In a relatively extensive cutting test – two hours making fuzz sticks, shaving paper thin slices off the end of a half inch diameter branch, making tinder from the log I was sitting on, and even carving a crude spoon – I detected no hot spots and the knife was still able to easily slice through paper afterward. This was all done with frozen drift wood found on the shore of Lake Erie. I was, however, wearing gloves as it was 20 degrees at the time. This may have eliminated any hot spots, but then again, I was able to do all of this while wearing gloves. With all of this in mind, I can easily say that the Persistence was worth the $40 that I payed for it. This might be a bit much for some considering the internet prices, but I purchased this knife in a locally owned store, payed no shipping, and got instant gratification. In my opinion, the Persistence is the absolute best in this line of knives. Sorry to be so long winded, but I hope this helps those who are on the fence with these particular knives. Thank you for this great site Dan and keep up the good work! Thank you very much for the detailed comment and mini-review of the Persistence! I am glad you like that knife, the size has always intrigued me and well, if it’s built like the Tenacious then I can imagine it being a solid knife for the money. I agree, a small knife is a great choice in an urban/suburban environment. I’ve had people actually call me out on using a Tenacious in public (saying it’s too big), and I can see where they are coming from. Thanks for your thoughts! Very good to hear that the Persistence has held up so well! Could you add what your thought are about limitations to the Persistence? Obviously with the shorter blade it might not be able to slice through a large apple with one slice, but are there other things that you see could be a limitation? As you stated, the shorter blade of the Persistence will have limitations in food preperation or the cutting of any larger items with one slice, but this is a given with any blade of this size. What is important to know about the Persistence and the rest of this line of knives is that as they go down in blade size, they go down in handle size. This is not just the length of the handle, but the width of the handle scales as they approach the cutting edge. The Persistence does not offer much protection for the index finger and the Ambitious offers none. So, in an emergency defensive role, I would only use the Persistence in a reverse grip. I would not try to stab anything with it and, in this role, I would not consider the Ambitious at all. The other limitation I can see is that, while not as fine as that of the Tenacious, the blade tip is still relatively fine. I learned many years ago as a child that you do not pry with a knife, and this knife is no exception. Others may say that the blade steel is a limitation on this knife, but I happen to be a big fan of user friendly steels like this (AUS 8 being my favorite). For my uses they hold an edge well, become shaving sharp very easily, and are reasonably tough. I have had harder steels chip under my use. This is no fun as knives with harder (higher end) steels tend to cost more. Thank Bill for your thoughts on handle length. I prefer a large handle even if the blade isn’t so that I can have a good grip regardless. I wouldn’t be using this knife for self defense, but I still don’t want to have to worry about my finger getting cut because the handle is short. Due to the jimping on the thumb ramp and the lightly textured G10 scales, the Persistence provides quite a bit of good traction and I had no issues with my hand sliding around. However, as I said, as these knives go down in size so does the size of the finger choil. I have measured the handle from where my index finger rests comfortably (directly forward of the cut out for the liner lock) to the end and it is 3.75 inches. As I said before, I wear a large glove and I can get a full four finger grip on this handle. I would still advise against stabbing anything with this knife though since hitting something hard may both damage the tip and could cause your hand to slide forward. For any normal draw or push cutting, this handle size is perfect for me at least. I hope this paints a little clearer picture for you. Was a nice idea to measure the handle like that. I think I will pass on this then as I like a little longer handle to hang on to. My current EDC is the Spyderco Centofante 3 that has a handle of exactly 41/2 inches, and this fits my hand almost perfectly. I really enjoy hearing your comments and look forward to more in the future! This knife was my intro-knife to Spyderco products. I was so impressed with the quality of its construction I have since gone on to purchase several Spydies: Delica, Endura, Dragonfly, etc. The only real issue is the steel is a rust magnet. Other than that its a great knife for someone on a budget. My first flipper, and the stories of knife acquisition begins…..
It’s time to it out and let it do some work. Always feeling nice to revisit old post as the review is informative and joyful to read. Thanks for the kind comment about an old review. I am glad these older reviews are still enjoyable. The Tenacious is probably responsible for getting a lot of people into pocket knives. It’s not perfect, but it gets its point across, and shows you what is possible with a modern folding knife. I love my Spyderco Tenacious, it just made its way into my EDC rotation.